I attended a two day seminar and workshop at Manchester university last week. The scholarly seminar was organised by Drs. Oliver Bast and Siavush Ranjbar-Daemi and examined the fall of the Iranian Prime Minister, Mohammad Mossadeq, in 1953. The seminar included academics from around the world, who had researched and studied the documentary evidence of the 1953 events in Iran. It was both enjoyable and illuminating as the experts on the subject presented their arguments and conjectures based on the different aspects of the evidence and archived documents they had studied. 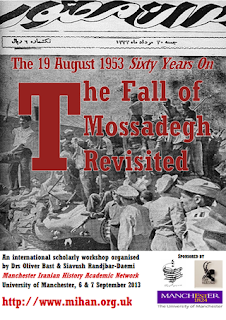 Siavush Ranjbar-Daemi gave a brief presentation of what the various newspapers at the time had reported and in particular which political groups had called for a Republic in the two day aftermath of the initial failed attempt to bring down Mossadeq on 16th August, 1953. Shahram Kholdi, from Western University in Canada, gave a presentation of the Iranian legal constitution at the time, its origins and what the legal authority of the Shah and the Prime Minister were. An important study to determine whether the toppling of Mossadeq was a coup or a legal constitutional move. The American scholar, Mark Gasiorowsky, talked about the evidence he had gathered from the people he had interviewed, which included CIA operatives at the time. Darioush Bayandor criticised Gasiorowsky for not having taken into consideration the declassified information that has been available since 2000 and that what most bothered him was an attempt by Gasiorowsky and his co-author, Malcolm Byrne at splashing some sensational headlines that new evidence proved the role of a CIA coup on 19th August as undeniable and argued that they were much sensationalism about nothing. A point that Gasiorowsky himself later admitted. Regarding the mystery of who brought out the crowds on 19th August that toppled Mossadeq, Bayandor offered his theory and the reasons as to why in his view, it was actually the influential Ayatollah Boroujerdi. and finally the East German born scholar ridiculed Madeline Albright for having apologised to the Islamic Republic of the 1953 coup, describing her as ill informed and badly advised on the subject. I was very much in agreement with Oliver Bast as to what he had to say about the media myths about Mossadeq. A recent report by CNN on Malcolm Byrne's sensational headlines for example, mentioned how Iran had gained its independence from Britain and Mossadeq had been sentenced to death for nationalising the Iranian oil! Oliver Bast also mentioned that in terms of tangible results, Mossadeq's success was almost zero and that there were other Iranian Prime Ministers, before and after Mossadeq, who were far more successful in achieving real results. There was also an interesting glimpse into the few Russian documents that are available on the subject. Next to nothing has been declassified by the KGB as this is not the norm in Russia but some diplomatic correspondence that were made available to one Russian born academic, showed contacts were established between Ayatollah Kashani and the Soviets who regarded Ayatollah Kashani as the only player able to bring the crowds into the streets. b) Until more documents are released and declassified, what actually happened on 19th August, 1953 will remain debatable. Fariba Sahraei, the BBC Persian reporter narrating the above footage, reduced the seminar into a much simpler event. 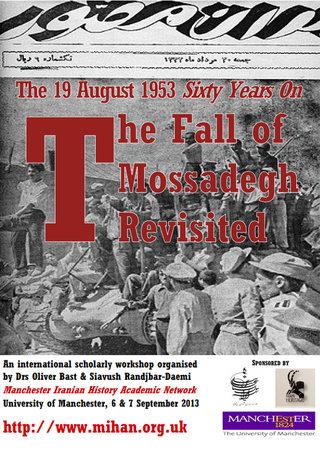 According to her, there is no doubt that Mossadeq was toppled by a CIA coup on 19th August, 1953 and almost all academics and experts agree on this except one man, Darioush Bayandor, who is single handedly trying to give a different version, and Bayandor's statements were strongly challenged by other academics who attended the seminar! A vivid example of lazy journalism and biased reporting that is becoming predominant on BBC Persian television. If you remember - I asked 2 questions from Dr. Milani at his meeting in London .I did not get any proper answer from either of them - maybe I did not frame my question as they should have been to give him an opportunity to give a good answer to them . I also attended the seminar in Manchester and found that there was a concerted effort, on the part of the conveners, to introduce a revisionist approach to the historic facts. Instead of a scholarly gathering, it turned out to be a forum for deniers. 1. "Oil was nationalized before Dr.Mossadegh became P.M."
For three months, prior to becoming P.M., Dr. M. was chairman of the Oil Committee, appointed by the Majless, to investigate the oil question and Iran's relations with AIOC. Under his leadership, the bill for nationalisation was prepared and presented to the Majless and the Senate. Prior to accepting the nomination as P.M. in April, he asked the Majless to ratify the draft Law for the Implementation of Oil Nationalisation, which had been drawn up in March by the Oil Committee, under his chairmanship. Upon the Majless and the Senate passing the bill without any amendment, he assumed his role as P.M. on the same day. So, yes, oil was nationalized hours before Dr. M. became P.M., but as a direct result of his guidance and leadership. It is to be remembered that the movement to redeem the interests of the Iranian people from AIOC, to eradicate the colonial treatment meted out to the country and its people, as well as to establish control over the national resources of the nation, all began in the 14th Majless (as early as 1943), propelled by Dr. M. and continued under his leadership until the Coup. 2. "Mossadeq was appointed by the Shah"
According to the constitution of Iran, valid at the time, Dr. M. was elected as P.M. by an overwhelming majority vote of the Majless, on the basis of which the Shah was obliged constitutionally to issue the ceremonial decree (the Farman), a constitutional formality observed before the Coup d'Etat. So, he was not "appointed" by the Shah. So, yes, oil was nationalized hours before Dr. M. became P.M., but as a result of his guidance and leadership. It is to be remembered that the movement to redeem the interests of the Iranian people from AIOC, to eradicate the colonial treatment meted out to the country and its people, as well as to establish control over the national resources of the nation, all began in the 14th Majless (as early as 1943), propelled by Dr. M. and continued under his leadership until the Coup! 3. "The Shah never abdicated". Absolutely correct and he left the country in a quandary as to how to proceed. Because, frightened of the possible outcome of the failed plot, he left in a hurry and before a regency council could be set up. In Rome, he told reporters he wished to buy a farm in America and settle there. Hardly conducive to ruling a country 10,000 miles away. Anyway, he did not get his wish, as circumstances whisked him back to Iran. Upon landing, the ONLY person allowed to approach him, before he sped off driving his own car, was Shaban Bi-mokh. A diplomatic report has stated that the Shah feared that he would be assassinated upon his return. The tumultuous and "spontaneous" outpouring of popular feeling for his return was only orchestrated days later. 4. "That 1953 was (NOT) a huge national trauma for Iranians". Yes, other incidents have been significant, before and after 1953. Yet, if it wasn't such a big deal, why is it that there are still international conferences being called on the subject, 60 whole years after the event? This touches upon the popularity of Dr. M. After 1953, his name became taboo. Eight years later, at the Jalalieh meeting of 1961 where, according to press reports, more than a 100,000 turned out to express their support for Dr. M. under house arrest, fearing a backlash, speakers were permitted to mention the name "Mossadegh" only once in their speech. Yet, when that moment occurred, the huge crowd would not stop their hurrahs, which went on for ten minutes, with every speaker. 5. "That Mossadeq was (NOT) brutally dealt with"
Diplomatic dispatches show that, initially, the Shah insisted that Dr. M. be sentenced to death. The sentencing was only revised after much pressure from UK and USA, warning the Shah that, were he to be executed, Dr. M. would be regarded as a martyr and there could be popular unrest. (The same goes for the refusal of the Shah to allow the burial of Dr. M., according to his will and testament, in a public place). Yet, though not physically harmed, for the next 14 years and until his death, a man of his intellect had to endure solitary imprisonment for 3 years in an army barrack and then in his secluded and isolated house at Ahmadabad, surrounded by the secret police and a platoon of gendarmes. Even to have a doctor attend him, permission had to be sought from SAVAK, in fact from the Shah. 6. Apologies for the 1953 coup. Madeleine Albright was not the only one to apologise. In a 2005 interview with Charlie Rose, published in Executive Intelligence Review, February 11, 2005, President Clinton said: "...the United States deposed Mr.Mossadegh, who was an elected parliamentary democrat, and brought the Shah back in...". President Obama has apologised as well. Would the U.S. Administration repeatedly apologise for an act which it did not carry out? That would be the ridicule which you mention. Yes, events of the era may be debated, but not denied. This post is about what was said and how it was reported on BBC Persian. If you wanted to challenge what was said or the "denials" as you put it, you had two days to challenge them during the conference. Your blog is not merely reporting the coverage of the event, but also your personal viewpoint of it. "I was very much in agreement with Oliver Bast"
and you belittle the BBC Persian reporting. Together with an expert on the subject, I was hoping to have an opportunity to give our views. In no uncertain terms, we were informed that would not be possible. For that reason, we channelled a very compressed summary of the above comment into a 3-minute talk, allowed to be given by a VIP guest, which the BBC did not report. As I was not amongst the speakers or staff, I was not invited to the two meals where all were present, when it would have been possible to have a discussion. However, I took the occasion of every break (the only other time afforded) to challenge any "denier".